Haspelknecht: The Story of Early Coal Mining transports players to the beginning of coal mining in the Ruhr valley in the 16th century. The players take upon the role of farmers who exploit the presence of coal in their lands in the southern part of the Ruhr region. Coal was discovered here, close to the Earth's surface, during a time when the lands were mostly covered with forests and roads were rare. Players will obtain unique developments, expand their farm, and dig deeper into the ground to extract more coal. The game has many paths that lead to victory. 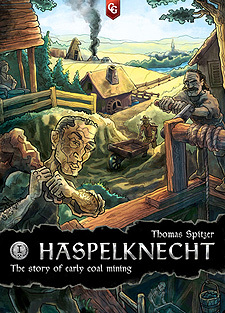 Haspelknecht: The Story of Early Coal Mining is the first game in Thomas Spitzer's coal trilogy.